In a nutshell, [The Bristol Evening Post] insisted that I could not rewrite its content and publish it on my site, even with a credit in the first paragraph and a link back to the original source on its website. A particularly amusing complaint considering newspapers up and down the country have passed off re-writes as their own for years. My reply to them was that if they really felt they had no need of free publicity from sites such as mine, which aims to provide people with a full range of news from ALL sources, then that was fine. I would in future take their own stories on myself, adding new angles and better balance of the issues, but would have no obligation to credit them as the original source. The fact is though is that I will continue to do that anyway, because I feel it is more honest and gives readers the chance to decide for themselves on the validity of what they are being presented. On Wednesday, I went to listen to Chris Anderson from Wired magazine in the US speak at a Festival of Ideas evening at @Bristol. The main point I took was that in the old economy of producing “stuff” – material goods – the costs inevitably rose year on year. But in the digital age the same pattern is repeating in reverse, the cost of producing digital material and content is falling year on year. What this means for journalists – and the people who still, I believe, want to read the news of what is happening in their community – is that the ability and costs to spread this news is falling closer and closer to zero. And this takes the power of “ownership” out of the hands of traditional news suppliers. We do not have to rely on them to find out what is happening in our city. That is how it should be. News was never meant to be owned in a democracy. It is about what happens to us and the people around us. And we are free to share it as far and wide as we can. 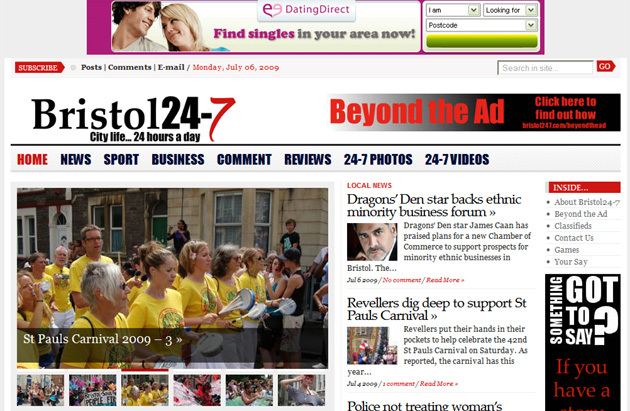 Like Phil Chamberlain, I appreciate that Bristol 24-7 hasn’t launched itself on a slurry on unpaid interns. But for all the inspiring talk of democracy and freedom, what it actually seems able to offer is a long way short of the sort of detailed scrutiny that could earn those terms – and unless it begins to see “new angles and better balance of the issues” as essential parts of reporting rather than the optional extras that let you carry off someone else’s story, it’s hard to feel hopeful for the 24-7 vision of the future.